1 The inner sock is made of 38% merino wool, 38% anti-piling acrylic and 24% nylon. The merino wool offers thermal insulation but also works with the acrylic and nylon to ensure that moisture is wicked away effectively. This helps to create a constant comfortable temperature for your feet. 2 The interlining is made from a waterproof and breathable Porelle Membrane - a functional high-performance microporous membrane that is light, flexible and durable. 3 The outer sock is made of 96% Nylon, 3% Elastane and 1% Cuff elastics - the combination of these makes for an abrasion-resistant sock protecting it from tearing after multiple uses. All in all, DexShell are ahead of the curb with this innovative technology. If you are looking for a waterproof sock with extra insulation, you cannot go wrong with a pair Dexshell Trekkings. 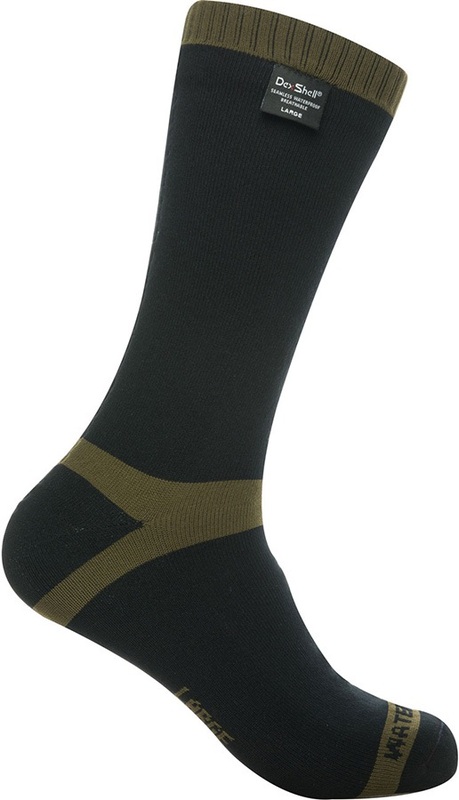 As a mid-calf sock, they will sit comfortably above your hiking boots and can also be worn with approach shoes. They are suited to colder temperatures so are ideal for use during winter. Whether you enjoy hiking, walking, or just need to a warm pair of socks to keep yout feet dry, DexShell Trekking is the ultimate choice!